When it comes to the U.S. Snowboard team, Shaun White, Hannah Teter, Gretchen Bleiler and company are outfitted by Burton. The same Burton designer who created the 2006 Torino gear, Greg Dacyshyn, developed this latest, low-key look. As for the pants? They're made to look like jeans, but they're really thin and hole-less. Click here to view a slideshow. Not only did Nike design the medal stand look that the U.S. Olympians will be wearing when they receive their medals, but you'll also see the sportswear giant's Swoosh on both the long- and short-track speed skaters. The speedsuits are reminiscent of some of the outfits introduced at the Beijing Summer Olympics among the track and field athletes--but don't quote me on that because it's just appearance that I'm going by. Nike has also furnished the curling team, and the men's and women's hockey teams. That spandex that the U.S. ski racers sport as they blaze down the hill? Spyder designed those and according to this story they are some of the fastest race suits out there--just think equivalent to the Speedo LZR racer that caused a commotion in the pool to the point of being outlawed. It's something in the fabric and are touted to reduce wind drag, which reminded me a bit of a story I wrote about technology back in Beijing. The Canadian alpine team is also sporting this high-tech design. Who's behind those fiery speed suits among the U.S. lugers at the Whistler Sliding Centre? That would be Karbon, the manufacturer primarily known for outerwear on the ski hill, at least in this neck of the woods. You'll also spot the Canadian-based company sponsoring all of the gear sported by the Australia and New Zealand Olympic teams, as well as some sports-specific teams from Chile, Ireland, Slovenia and Canada. As the freestyle skiers blazed down the moguls and helicoptered through the air earlier this week at Cypress Mountain, they wore the likes of Under Armour. Daredevil Evel Knievel provided the inspiration behind the speed suit, pants and jackets that both the U.S. Freestyle Skiing and Bobsled teams sport. The look has already turned a few heads when Hannah Kearney, Shannon Bahrke and Bryon Wilson stood on the medal stand after the mogul competitions. Only problem? You can't find a mock-up online, but you can score some Team USA gear (however it's a little buried at underarmour.com). No Olympics would be complete without a few call-outs to fashion designers. There's the obvious, unveiled at the opening ceremonies. 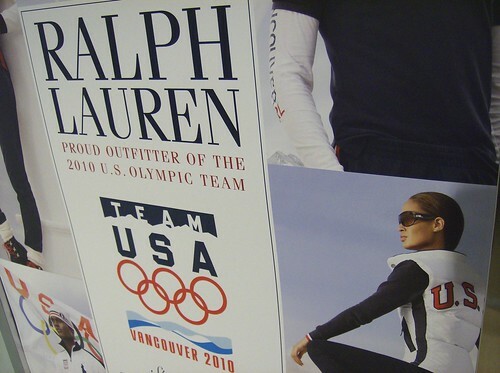 Ralph Lauren designed the styles for Team USA that they'll be sporting at the opening and closing ceremonies, complete with the famous Polo horse. And then the not so obvious. Vera Wang designed Evan Lysacek's skating outfits appearing in Vancouver, from the feathered ensemble during the short program to the look he'll reveal for tonight's long program. Haha, I love it :) Thanks for reading!